Established in 1971, United Farmers is a co-operative organisation operating on a not-for-profit basis, with the clear aim of bringing together the combined purchasing power of its members and promoting inter-member co-operation. 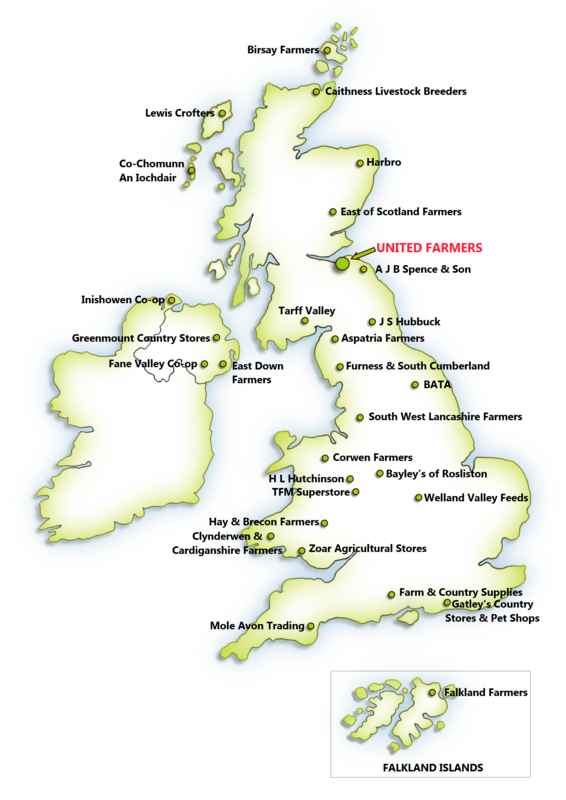 United Farmers has 29 members with over 120 retail stores throughout the United Kingdom, Ireland and the Falkland Islands. Our members’ retail stores offer a comprehensive range of products required for all commercial farming and rural living. United Farmers undertakes trade negotiations on behalf of its members with selected suppliers, to bring the benefits of consolidated volumes and sales growth to both its suppliers and members. We are here to facilitate and develop relationships between our members and chosen suppliers for a common goal…….Growth! across the uk and the Falkland Islands. United Farmers work to help members keep their independence through the strength of collective purchasing collaboration, delivering the best products at the best value for our members' customers. Elected from within our membership, the United Farmers Board devise the strategy that allows the organisation to deliver maximum benefits to our members, their customers and United Farmers suppliers. Contact our Head Office in Edinburgh.